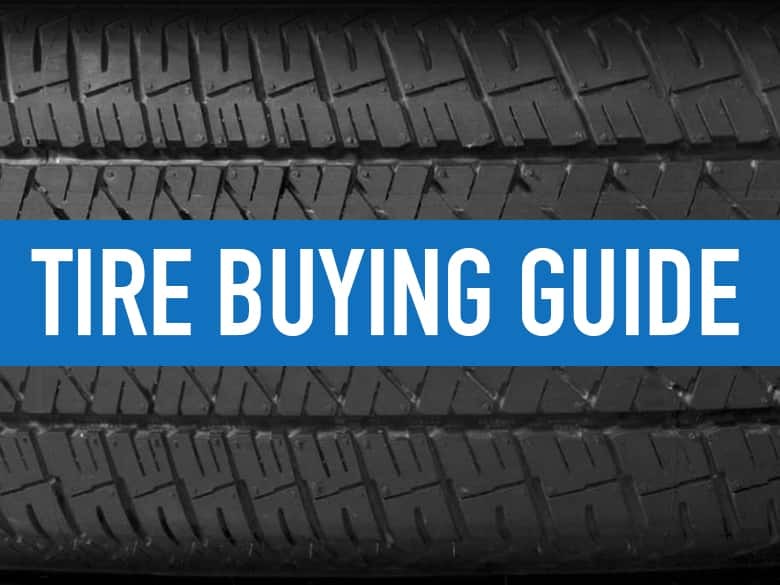 Find out when to shop and how to save on your next set of tires. Tires are one of the more common — and expensive — vehicle maintenance items out there. While you can't always predict exactly when you're going to need new tires, planning ahead can help you save a bundle. To aid with that planning, we'll discuss when your tires need to be replaced, what tires you should get, and where you can find the best deals. Our friends at Tire Rack have a very detailed description on how to decipher the alphanumeric code listed on the outside of your tire. When it comes time to buy new tires, you'll need to know the tire width, aspect ratio, and rim size. The life of your tires varies depending on the tread depth and manufacturer, but in general, you can expect a set of tires to last anywhere from 40,000 to 90,000 miles. The manufacturer will generally warranty the tire up to the advertised tread life. All tires sold in North America feature “wear bars” that, when they become flush with the rest of the tread (at a height of 2/32"), let you know you need to get new tires in order to be street legal (in most states). In most cases — especially in areas with rain or snow — it would be best to start shopping before you reach that point in order to avoid a loss in traction. Here's a quick way to check tire tread depth: stick a quarter next to a wear bar, and if any portion of George Washington’s head is covered, then you still have enough tread. The age of your tires is also important if you happen to buy a low-mileage vehicle that is older and may have the original tires. Typically, manufacturers will state that tires need to be replaced after six to 10 years. It is worth inspecting the tread and tire sidewall for cracks or dry-rot from sitting for too long, and replacing them if you see signs of wear. The manufactured date of a tire will be the last four digits of the tire's serial number. The first 2 digits will be between 01-52 and tell you the week in the year that it was made. The last 2 digits designate the year from 2000-2017 represented as 00-17. So a tire serial ending in 4816 would be manufactured in the 48th week of 2016. What Types of Tires Should You Consider? There are various types of tires to consider when purchasing a replacement for your current set, and the type you pick is largely dependent on the sort of climate in which you live. Summer tires will perform best in dry weather and some wet conditions, but should not be used for any snow or sleet driving. Winter tires will have added grip during those slushy drives through snow, but will wear faster and decrease the handling and braking distance in dry conditions when compared to a summer or all-season tire. If you live in an area with extreme weather changes, having a set of winter tires to put on for the snowy winter months is probably a good idea. All-season tires are just as the name describes, and offer good year-round capabilities through rain, snow, and dry conditions. If you live in an area that experiences all four seasons in a way that's not too extreme, all-season tires should be all you need. Some major tire chains will price match any deal for the exact tire listed by a major competitor. Take the time to shop around locally and online for the lowest price and bring a printout showing proof of the details. Be sure to factor in the cost of shipping with tires from online retailers, as their listed prices aren’t the price to get it to your door. If a retailer doesn't list price matching as a company policy, it still doesn't hurt to ask since some local places may work with you to keep your business. The best time to buy tires is just before the busy summer and winter seasons. Watch for online ads or posted specials at your local retailers around that time. They will also generally have mail-in rebates that can save you anywhere from $20 to $100 off a set of four installed tires. Some rebates will even stack, so you can get money from both the retailer and the manufacturer of the tires. If you are willing to open a new line of credit, there can be additional savings through chains like Discount Tire or NTB Tire. These specials often offer 0% interest for six months for a full set of tires with installation. You will generally be rewarded with a Visa gift card for making a purchase via their financing, even if you pay it off before the first billing cycle. Just be sure to read the fine print and avoid any interest charges. The large wholesale store is a Slickdeals staple in the Wheel and Tires section. The tire selection is pretty limited to brands like BF Goodrich, Michelin and Bridgestone, but the deals are impressive. Costco will generally have rebates leading up to the summer for around $60 to $120 off a set of four tires and installation. If you favor selection, low prices, more variety, and detailed information and reviews, then TireRack may be a good place to start. Be aware that while some of the listed prices may seem very cheap, you will also need to factor in shipping and installation at a local shop. TireRack does let you sort by tires that have current specials or discounts though, which makes shopping a bit easier. Large chains like Discount Tire will begin to ramp up their promotions right before the summer. Slickdealers have found savings of up to $320 off specific tire and wheel packages this month. The rebates are often specific to certain tire brands and sizes though, so be sure to verify that the tires for your vehicle are eligible. Is Buying Used Tires a Good Idea? Buying used tires can save you money, but there are several factors to consider. New tires come with mileage warranties, so the relative value of that warranty should be factored into the savings. With a used tire, you'll want to thoroughly check the remaining tread, manufacture date, and overall condition of the tire before buying. For example, you'll want to know if it has been patched or damaged in some way. Is there any bubbling or noticeable defects? If the tire is defect-free and it has a decent amount of tread left, it could be worth a try.